There are a plethora of plans and proposals for the reform of the U.S. health care system being promoted by every imaginable interest group, vested interest and limelight seeking politician. I have gathered a few repsentative samples here to give you an idea of what is being offered. It is very likely that some of the elements of these proposals will be included in the new health care system. For those who long for or dread a government owned and operated single payer system, here’s a chance to see how one operating within the United States would be structured, governed, funded and operated. A bill was introduced into the California legislature on 27 February 2009 that would create a state owned and operated single payer health care system in California. For those who have never read legislation before, it will be an interesting introduction to how the laws that define our society are written. For those interested in how a single payer model of health care might be structured, it will be interesting reading. For those adamantly opposed to or in passionate support of a single payer system, there will be plenty of material to absorb. One opinion I have openly stated in this thread is that a single payer system is not on the table as an option for a national health care system. I have stated that it is a complete political non-starter and a ‘third-rail’, poison topic at the national level. I have stated that any system we end with nationally will retain all the familiar components we currently know, such as private insurance companies, HMOs, PPOs, lawyers, etc. I still hold those opinions. On 10 June 2008 the Chairman of Aetna, Ron Williams, presented testimony to the U.S. Senate Committee on Finance regarding health care system reform. They have the ear of congress. They pay an army of highly polished and deeply entrenched lobbyists to present their case, write bills and accomplish their goals. Their phone calls get answered. They have a decades long track record of contributing to politicians, that means they own reliable votes. They know this business. This is what they do, every day. They know the operational challenges and the opportunities. They know the political realities. They know what is politically possible because they are one of the largest players in owning and controlling the political process related to their business segment. If they propose it and champion it, then it is very likely to be something that can be accomplished within the existing political environment. They are respected in the halls of power. They are rich and powerful. Both are highly effective aphrodisiacs for politicians. They are here to stay. Love them or hate them, the insurance companies are not going away. They will be part of any new system. It is important to know what they are pushing for, because those proposals are very likely to be part of any solution. A robust body of research concludes that the uninsured obtain less care, receive fewer preventive services and fail to adhere to recommended treatments. Additionally, tens of billions of dollars are spent each year treating those without health insurance, often in expensive emergency room settings for illnesses or chronic conditions that could have been prevented or treated earlier had they been part of a course of care associated with having health insurance. (1) Price Waterhouse Coopers, “The Factors Fueling Rising Healthcare Costs 2006,” Prepared for America’s Health Insurance Plans, January 2006. (2) Of this total premium cost, workers pay an average $3,281 from their paychecks, with employers covering the remaining premium costs. Gary Claxton, Samantha Hawkins, Jeremy Pickreign, et al. “Employer Health Benefits: 2007 Annual Survey,” Kaiser Family Foundation and Health Research and Education Trust, September 2007. Accessed online: www.kff.org/insurance/7672/upload/76723.pdf. Require all Americans to possess health insurance coverage — an individual coverage requirement — as a common-sense approach for achieving universal coverage through universal participation. Strengthen public programs to ensure certain populations have access to quality health care. strengths to make the individual market function betterEqualize the tax treatment of health insurance for those who obtain coverage through their employer and those who purchase it directly in the individual market by extending favorable tax treatment to both sets of individuals, without changing the favorable tax treatment employers currently receive for offering benefits. Permit the purchase of health insurance across state borders (that is, rather than having to purchase in one’s home state) so consumers can use phone, mail and internet facilities to purchase coverage in states with legislative and regulatory environments that facilitate the existence of affordable health insurance options. Create incentives for individuals to achieve optimal health status by making healthy choices, participating in wellness, chronic care and disease management programs and obtaining routine preventive care. Reward health care providers who efficiently deliver evidence-based care through pay-for-performance (P4P) programs. Transform the medical liability system into one that focuses on the fair and timely resolution of medical disputes and promotes health care quality improvements. The medical liability system should encourage — not discourage — physicians to discuss and learn from mistakes and preventable errors. Create new pooling mechanisms that facilitate affordable access to health insurance for individuals and small employers. Encourage uniformity of state laws and regulations. Explore the development of an optional federal charter. Invest in efforts to improve health and benefits literacy, especially for the nearly half of adults in the nation who have difficulty locating, matching and integrating written information. Advance public-private partnerships to develop and implement health information technology (HIT), including personal health records and the development of an interoperable health record system that allows for the seamless and secure transmission of health information. “Think Tanks” are advocacy and resource organizations that strive to shape public opinion and public policy related to specific issues. They can be for-profit or non-profit, highly partisan or non-partisan. They are almost always populated with former politicians, ex-political staffers and former administration officials. They provide issue-related briefings and resources for publicly elected officials, administration staffers, legislative staffers and the press. They are a primary go-to resource for “experts” who provide the quotes and are the talking heads for print media, commercial blogs and television. The Alliance for Health Reform (AHR) provides briefings, experts and media guides related to health care reform. These are the same briefings that the staffers, lobbyists and elected officials who will determine the future of health care in the United States receive. The “experts” the AHR provides are the voices forming public opinion on this issue via quotes in print media, television sound bites and “talking head” appearances. The media guide(s) shape coverage of this issue. Most news stories will be mildly edited direct lifts of the information provided. Non-partisan, non-profit think tanks have an aura of reliability, respectability and virtue that politicians desperately need, and consequently seek to wrap themselves in. Who really pays under an employer mandate? Does it have an individual mandate? Is it enforceable? Is this bipartisan enough to actually pass? Willingness of high-income people to redistribute? Hardly anyone’s favorite: third place behind status quo? The RAND group of organizations provides private and public policy data and analysis. The RAND Health group provides data and analysis for private companies and public policy in areas related to health. The RAND COMPARE group was formed specifically to provide data and analysis related to health care reform. Full disclosure: I personally know one of the program managers for the RAND COMPARE program. I have respect for the level of professionalism and quality of analysis the RAND COMPARE team bring to the table. RAND has a decades long track record of reliability and respect in providing data and analysis for public policy. This provides much needed integrity and a shield to hide behind for politicians. RAND provides much of the research compilation, base data and analysis used by industry, think tanks and other advocacy groups. This is primary source material from the public policy standpoint. RAND team members brief everyone involved in health care public policy, including elected representatives, but more importantly, capital hill staffers and the press. The board and sponsors of the RAND COMPARE program are a who’s who of influential players in health care. RAND has been a primary source of data and analysis for the health care reform related posts. To see what the RAND research compilation, data and analysis has to say about health care, view the authoritative copy, graphs and tables in the health care reform posts and visit the web sites above. Political advocacy groups exist for nearly every issue, profession and market segment. They typically are very narrowly focused on specific issues relevent to their stakeholders. They work to affect public policy through public relations, direct interactions with elected representives, capital hill staffers and via campaign contributions to elected officials. Healthcare Professionals for Healthcare Reform (HPfHR) is a group of physicians, nurses, public health experts, healthcare economists, health information technologists, business leaders, hospital administrators, politicians and patients with a 3 Tier plan that offers a comprehensive, effective, efficient and politically viable alternative to the current defective system or other plans previously proposed. The HPfHR plan is called Expanding Medical and Behavioral Resources with Access to Care for Everyone (EMBRACE), and is based on the tenet that the entire population should be covered for life sustaining and health promoting “basic” healthcare with supplemental levels of coverage for those desiring it. The plan is designed to make healthcare delivery more effective, efficient, and universal; yet, preserve the unique American character of the present system. Healthcare Professionals for Healthcare Reform is a group of physicians and others interested in health care reform who, recognizing the urgent need for change, convened to propose a universal health care plan that builds on the strengths of the U.S. health care system and improves on its coverage, efficiency, and capacity for patient choice. The group proposes a tiered plan, the core of which (Tier 1) would be lifetime, basic, publicly funded coverage for the entire population on the basis of the best evidence about which therapies are considered life saving, life-sustaining, or preventative. Optional coverage (Tier 2) would be funded by private insurance and cover all therapies considered to help with quality of life and functional impairment. Items considered to be luxury or cosmetic (Tier 3) would generally not be covered, as is the case under the current system. The entire system would be overseen by a quasigovernmental, largely independent organization known as “The Board,” which would resemble the Federal Reserve and interact with U.S. Department of Health and Human Services agencies to oversee implementation and coverage. By building on the current health care system while introducing other features and efficiencies, the Expanding Medical and Behavioral Resources with Access to Care for Everyone (EMBRACE) plan for universal health insurance coverage offers several advantages over alternative plans that have been proposed. The United States spends twice as much per capita on health care as other developed countries (1) but ranks in the bottom third for important measures, such as infant and maternal death rates and life expectancy (2). Current interest in U.S. health care system reform focuses on the expansion of health insurance to more individuals (3), but many proposals lack the structure that would improve the health of Americans in an affordable, efficient, and transparent way that maintains or even expands patient choice (4). Healthcare Professionals for Healthcare Reform is a group of physicians, nurses, medical technicians, hospital administrators, public health experts, health care economists, business leaders, politicians, and patients who, inspired by the realization that conversations about health care reform lack input from health care professionals, convened to propose a universal coverage plan that builds on the strengths of the U.S. health care delivery system and improves on its efficiency and capacity for patient choice. Our plan, called Expanding Medical and Behavioral Resources with Access to Care for Everyone (EMBRACE), is based on a tiered approach to health care and on the tenet that the entire population can be covered for life-sustaining and health-promoting (basic) health care, with additional coverage available for those who desire it. The EMBRACE system would be composed of 3 tiers of coverage. Tier 1, the base level, would cover the entire population from cradle to grave. It would include all medical, surgical, and psychiatric therapies considered to be life saving, life-sustaining, or preventative on the basis of the best evidence (from the medical literature and expert opinions). A government-subsidized account similar to Medicare would provide the funds (with the elimination of all other public insurance). The method of raising this revenue could be similar to the present funding of Medicare (such as the Federal Insurance Contributions Act tax) and Medicaid, but because businesses should receive substantial savings after initiation of this plan, additional sources of revenue may be considered. These could include payroll taxes (indexed to salary), a tax on businesses on the basis of the number of employees (and their wages), or a combination of these. Because the number of items covered by Tier 1 in this new system would be substantially less than what Medicare and Medicaid currently cover, funds would be available to redistribute to achieve universal Tier 1 coverage. We believe that this should be a “revenue neutral” redistribution of public funding. Tier 2 would cover all therapies considered to help with quality of life, as well as some diagnoses or services that do not have sufficient evidence for a Tier 1 indication. Private insurance carriers would administer Tier 2 services. The private insurance carriers would be allowed to offer a limited number of plans that would be developed by an oversight board (see next section), similar to the Medigap Plans A to L now stipulated by the Centers for Medicare & Medicaid Services (5). Although each insurance carrier would not have to offer all the plans, the offered plans would cover all the services stipulated by the board. A major advantage of this approach is that consumers (either employers or individuals) can compare the price of the plans. Tier 2 plans can be broad (covering most Tier 2 services) or can be customized for specific groups, such as a geriatric plan that covers extended care facilities but not fertility care, a heavy laborer plan that includes chiropractic therapy, or a Workman’s Compensation plan purchased by employers, employees, or unions. Tier 3 would apply to all medical and surgical issues considered luxury or cosmetic, such as Lasik surgery or Botox treatments. Funding for Tier 3 would not be covered under the EMBRACE system—as in the current system—and all bills would go to the patient. Pharmaceuticals will have similar Tier assignments for medical coverage: Tier 1 would include formulations and therapies that treat or prevent serious illnesses and would mostly be paid for by public funds or be heavily subsidized. Tier 2 would apply to those drugs and therapies that enhance quality of life and would be covered by private insurance. Tier 3 would be for luxury items. Our proposed system would be overseen by a panel of physicians and other health care professionals, public health experts, and economists who specialize in health care, known as “The Board”. The Board’s mission would be to promote the health of Americans in a socially responsible and economically sound way. Similar to former Senator Tom Daschle’s recently proposed “Federal Health Board”(6), it would be a quasigovernmental organization that resembles the Federal Reserve, which should make it less beholden to political pressures. It would be headed by a chairperson who would be appointed to a 10-year term by the president and require Senate confirmation. The Board would have oversight of the Centers for Medicare and Medicaid Services and input into the Food and Drug Administration and the National Institutes of Health. Using already-established Diagnostic Related Group, Ambulatory Payment Classification, and International Classification of Diseases codes, the Board would decide which diagnoses and services are covered by Tier 1, 2, or 3 on the basis of medical importance (by using evidence-based data, including practice guidelines developed by expert medical panels, Cochrane Library reviews, and other sources), public health considerations, and economic effect. These assessments would be updated periodically. The Board’s authority to direct the National Institutes of Health and the U.S. Food and Drug Administration would allow it to direct research that focused on the therapeutic issues that it needs to achieve its mission (to improve the health of the country and reduce costs). For example, if evidence supporting a particular treatment is based on expert consensus, the Board may direct the U.S. Food and Drug Administration (for a medication or device) or National Institutes of Health (for an intervention) to request applications for studies that will allow better tier determination. Among the prerequisites to the implementation of this system would be delineation of the specific relationships between the Board and existing agencies within the U.S. Department of Health and Human Services, in particular the U.S. Food and Drug Administration and the National Institutes of Health. Some reorganization of these government agencies might be warranted to optimize interagency interactions. To address the excessive overhead involved in claim submission by providers and insurance companies, the Board would create a universal reimbursement form that would be implemented electronically by using a Web-based tool available to hospitals and physician offices. This form would be the only form of billing for all providers and would be Internet-based and simple to use. Form data would be transmitted to a central billing system, which would decide whether the condition or service is Tier 1, Tier 2, or Tier 3. Tier 1 services would be reimbursed directly to the provider. Tier 2 services would trigger a computerized search for insurance coverage; if insurance is found, the insurance carrier would be billed and if not, the patient would be billed. Bills for Tier 3 would be sent directly to the patient. To help with questions about the assigned tier for a particular service, the central billing system would have a billing inquiry feature available to providers and consumers to allow inquiries about tier assignment in advance. Ideally, a single-payer model would accomplish the goals of improving the health of the nation with a uniform and universal system of health care delivery. One such proposed system is the “Physicians for a National Health Program” model. Proposed in 2003 (7) and introduced to Congress in 2007 as H.R.H. 676 (8), the plan advocates an expanded Medicare system that would exclude all private insurance payers and eliminate all for-profit hospitals and HMO-type providers. Like our proposal, the Physicians for a National Health Program plan would provide patients universal access to approved medical care that would be paid by a national health insurance agency. However, if the desired treatment or service in the Physicians for a National Health Program system is not approved, patients will most likely find ways outside of the system to obtain that service. As in other countries with a single-tiered health care system, use of unapproved services may lead to a de facto multitiered system (9). In these latter systems, parallel outside enterprises often grow, become private, and compete with the publicly funded system—usually to the detriment of both. EMBRACE encourages private (Tier 2) participation for those services that are not publicly financed. The existence of this integrated private tier would allow for fewer covered services in Tier 1, which in turn would reduce the public financial burden. In addition, allowing all the tiers to be a part of the same system would allow patients to see the same provider for all services and render all services subject to the same ultimate oversight. Politically, a system that continues to allow private, for-profit insurance and some degree of free market forces would be more viable than a system that attempted to control or eliminate them. Our plan preserves many of the favored features of the present system, such as a provider’s ability to offer all services even if they are Tier 2 or Tier 3, which would keep the new system more familiar to the patient and provider and in turn facilitate the transition to it. The EMBRACE plan offers universal coverage for essential health care and promises to reduce mortality and morbidity and encourage preventative care. The increased efficiency of the system should allow hospitals to reallocate funds to other services, such as health information technologies, and allow health care professionals more clinical time. For the patient, the system offers universal coverage for basic health care needs, transparency for Tier 2 coverage, and complete portability of all insurance coverage. Employers would be relieved of the financial burden of coverage for most services but retain the option to offer Tier 2 coverage as a benefit to employees. Finally, insurance providers would benefit from the elimination of the financial risks associated with Tier 1 services, and the system at large would benefit from centralized billing and a reduction in administrative overhead. From Bridgeport Hospital, Bridgeport, Connecticut; Yale School of Public Health and Yale School of Medicine, New Haven, Connecticut; Brigham and Women’s Hospital and Harvard Medical School, Boston, Massachusetts; West Virginia College of Business and West Virginia University, Morgantown, West Virginia; and Columbia University College of Physicians and Surgeons, New York, New York. Acknowledgment: The authors thank Harlan Krumholz, MD, SM, Harold H. Hines, Jr., Professor of Medicine and Epidemiology and Public Health, Yale School of Medicine, New Haven, Connecticut. Potential Financial Conflicts of Interest: Grants received: K.A. Yonkers (Pfizer, Eli Lilly, Wyeth). Requests for Single Reprints: Gilead I Lancaster, MD, The Heart Institute at Bridgeport Hospital, 267 Grant Street, Bridgeport, CT 06610; e-mail, pglanc@bpthosp.org. Current Author Addresses: Drs. Lancaster and O’Connell: Bridgeport Hospital, 267 Grant Street, Bridgeport, CT 06610. Dr. Katz: Yale Prevention Research Center, Griffin Hospital, 2nd Floor, 130 Division Street, Derby, CT 06418. Dr. Manson: Division of Preventive Medicine, Brigham and Women’s Hospital, Harvard Medical School, 900 Commonwealth Avenue, 3rd Floor, Boston, MA 02215. Mr. Hutchison: 7 Overlook Drive, Newtown CT 06470. Dr. Landau: Connecticut Heart and Vascular Center, 2979 Main Street, Bridgeport, CT 06606. Dr. Yonkers: Yale School of Medicine, 142 Temple Street, Suite 301, New Haven, CT 06510. 1. Chen L, Evans D, Evans T, Sadana R, Stilwell B, Travis P, et al. The World Health Report 2006: Working Together for Health. Geneva, Switzerland: The World Health Organization; 2006. Multi-disciplinary, multi-stakeholder and multi-segment groups are formed to develop solutions based on multiple perspectives. They are typically formed as “blue ribbon commissions” to examine post-event causality factors or to take on major policy questions that politicians want to avoid personal identification with or attachment to. In other words, they are usually formed to address the really hard choices and aspects of public policy that are destined to alienate and arouse powerful interest groups. Multi-stakeholder groups are often the only voice that includes pragmatic approaches that provide potential solutions that offer a reasonable compromise between all affected parties. The FRESH-thinking Project was formed to address health care system reform. Their health care reform proposal is the result of a series of workshops during which physicians, health policy experts, health insurance executives, business leaders, hospital administrators, economists, and others who represent diverse perspectives came together. 1. Replace the current fee-for-service payment system with a payment system that encourages and rewards innovation in the efficient delivery of quality care. The new payment system should invest in the development of outcome measures to guide payment. 2. Establish a securely funded, independent agency to sponsor and evaluate research on the comparative effectiveness of drugs, devices, and other medical interventions. 3. Simplify and rationalize federal and state laws and regulations to facilitate organizational innovation, support care coordination, and streamline financial and administrative functions. 4. Develop a health information technology infrastructure with national standards of interoperability to promote data exchange. 5. Create a national health database with the participation of all payers, delivery systems, and others who own health care data. Agree on methods to make deidentified information from this database on clinical interventions, patient outcomes, and costs available to researchers. 6. Identify revenue sources, including a cap on the tax exclusion of employer-based health insurance, to subsidize health care coverage with the goal of insuring all Americans. 7. Create state or regional insurance exchanges to pool risk, so that Americans without access to employer-based or other group insurance could obtain a standard benefits package through these exchanges. Employers should also be allowed to participate in these exchanges for their employees’ coverage. 8. Create a health coverage board with broad stakeholder representation to determine and periodically update the affordable standard benefit package available through state or regional insurance exchanges. The FRESH-Thinking project (www.fresh-thinking.org) convenes a multidisciplinary group of scholars who collaborate to comprehensively study the specific, detailed challenges to health care reform. This group represents diverse sectors of the health care system and beyond—physicians, health policy experts, health insurance executives, business leaders, hospital administrators, economists, and others. Through the FRESH-Thinking project, the authors met in a series of 8 workshops to delineate “essential foundations” necessary for fundamental reforms in the U.S. health care system. Despite diverse perspectives and policy positions, the group agreed that the United States must create a health care system that provides all Americans access to an affordable, standard benefits package. We must simultaneously build the capabilities, infrastructure, and incentives to ensure that all Americans receive high-quality care. Through an iterative process of debate and comment, we found common ground on 8 fundamental policy recommendations to achieve these aims. In formulating the recommendations, we achieved consensus on the following underlying observations and principles: First, the main problems of the U.S. health care system—coverage, cost, and quality—are well understood and well documented. Second, improving access alone is insufficient. Most discussions about reforming the system primarily focus on how to finance expanded coverage. Sustainable reform, however, must substantially change both the financing of care and the systems for organizing and delivering care. Finally, doing nothing is not an option. Maintaining the status quo in health care represents a significant threat to government finances, the economy, Americans’ standard of living, and our nation’s future. It is impossible to solve the problem of access to health care services without fixing the financing system. But without fixing the delivery system, it is impossible to solve the cost and quality problems in a sustainable manner. Escalating costs will undermine access, and poor quality will add costs and undermine the overall value of health care coverage. Patchwork and haphazard incremental changes have not and will not create a sustainable system. Reform requires a systematic, goal-directed process; new programs and policies must offer a coordinated and coherent approach, and they must reinforce each other. For instance, a health information technology infrastructure and better outcomes measures are necessary to pay physicians and other providers on the basis of results, but merely providing the infrastructure without reasons for clinicians to use it will simply add expense. Reform of the health system will not occur overnight. We must find a place to start. Mindful of the urgency, we have formulated these 8 recommendations as an essential foundation to achieve needed fundamental reforms regardless of the particular policy options chosen. Some of the recommendations pertain to reform of the financing system and others to reform of the delivery system. Current payment mechanisms reward the provision of narrowly defined services and increased product volume, independent of appropriateness or health outcomes. Instead, payments should be linked to improving patient outcomes, reducing racial and other disparities in outcomes, increasing efficiency, and moderating the growth in the cost of care. Linking payment to outcomes will require continued investment in the systematic development of outcomes measures. Current efforts are laudable, but they should be augmented with the development and rigorous evaluation of additional pilot and demonstration projects that use different payment mechanisms, such as bundled or global payments and capitation, as well as new ways of organizing and delivering care. These projects must use clear performance criteria so that the system rewards the approaches known to improve patient outcomes or save resources and terminates those that compromise patient outcomes or increase the cost of care. Because of their important role in the health care system, Medicare and Medicaid can lead the efforts in payment reform. Data are lacking on the effectiveness of medical interventions and processes of care. An independent agency not subjected to interest-group pressures should sponsor both analyses of existing data and new research on the effectiveness, comparative effectiveness, and cost-effectiveness of health care diagnostics, therapeutics, procedures, and processes of care. All public and private payers (including self-insured organizations) benefit from such assessments and should contribute resources to funding the agency. The data, analytic methods, and evaluative criteria used should be transparent and the results of its research widely disseminated to the public, physicians, government agencies, insurers, and other health care providers to inform health decisions. Both federal and state laws and regulations provide inconsistent requirements that frequently inhibit reform of the health care system, especially the coordination of care among various providers and more effective use of physicians, nurses, and other providers. Reform should include, but not be limited to, state laws and regulations governing the corporate practice of medicine doctrine and scope of practice limitations. The states should retain authority for enforcement of provider licensure, credentialing, and consumer protections. Federal and state laws should be revised to allow gain-sharing in situations with bundled or aggregated payments that improve patient outcomes, reduce disparities, or enhance efficiency. 4. Develop health information technology infrastructure with national standards of interoperability to promote data exchange. Effective deployment of health information technology is essential for collecting data on outcomes to guide quality improvement. A successful health information “superhighway” requires the rapid development and implementation of national standards for interoperability and exchange of electronic data to facilitate the collection and sharing of data on health care quality, outcomes, and cost throughout the health care system. Most health plans and healthcare providers do not effectively use existing data to improve the efficiency and quality of care.. The expansion of health information technology recommended above will provide additional sources of valuable data. To effectively use these data in improving the health care system, national standards should be implemented for combining the data to ensure consistency and comparability. Researchers using transparent and established methods should have as much access as possible, but patient confidentiality and a level of proprietary interests should be protected. Everyone is aware of the tens of millions and growing numbers of uninsured Americans. More than 70% of these Americans lack insurance because they cannot afford it. Revenue sources, including but not limited to savings from capping the tax exclusion of employer-based health insurance, taxing tobacco, and redirecting existing health resources, should be mobilized to ensure coverage for all Americans. Because of risk selection and underwriting, the small group and individual insurance markets perform poorly. Exchanges in which insurance companies offer a standard benefits package with guaranteed issue, portability and renewability, and no exclusions for preexisting conditions can expand the offerings to small groups and persons at lower rates. Along with mandatory coverage for standard benefits, the exchanges must implement risk-adjusted payments to minimize adverse selection. These mandates on insurance companies must be matched by mechanisms to ensure complete participation of those eligible to prevent the accumulation of only high-risk persons within the exchange. Potential mechanisms include substantial subsidies, possibly combined with enforceable mandates; employers should be allowed to participate in these exchanges for their employee coverage. For insurance exchanges to operate efficiently with competition on cost and value, they must have standard benefits packages. Design of these standard benefits packages will entail attention to many technical details and tradeoffs. An independent board with broad input would be best able to formulate options for standards benefits packages that Congress and the current administration could accept or reject. These packages could also define the base coverage that employer-based plans must meet to be eligible for tax exclusions. Individual participants should have the option to purchase packages with more coverage. The challenge of creating consensus is significant but surmountable. The FRESH-Thinking project demonstrates that, despite diverse backgrounds and interests, people can agree on fundamental elements that will provide a solid foundation for a health care system. The essence of these elements is the reform and modernization of how we both finance and deliver health care to ensure real value—better quality care and improved health of Americans at sustainable growth in costs. From Stanford University, Stanford; University of California, Berkeley, Los Angeles, and San Francisco; University of Southern California, Los Angeles; The Permanente Medical Group, Oakland; Hill Physicians Medical Group, San Ramon; Varian Medical Systems, Palo Alto; Palo Alto Medical Foundation Research Institute, Palo Alto; Insure the Uninsured Project, Santa Monica, California; University of Michigan, Ann Arbor, Michigan; Weill Cornell Medical College, Ithaca, New York; Humana, Louisville, Kentucky; University of Texas at Austin, Austin, Texas; Texas Pacific Group, Fort Worth, Texas; Wake Forest University, Winston-Salem, North Carolina; Washington and Lee University, Lexington, Virginia; New America Foundation, Washington, DC; The Leapfrog Group, Washington, DC; The Urban Institute, Washington, DC; George Washington University, Washington, DC; Center for Medical Technology Policy, Baltimore, Maryland; Rutgers University, New Brunswick, New Jersey; University of Chicago, Chicago, Illinois; City University of New York, New York, New York; Enable Medical Technologies; Boston University, Boston; NKT Therapeutics, Boston; Harvard University, Boston, Massachusetts; Dartmouth School of Medicine, Hanover, New Hampshire; Dartmouth Institute for Health Policy & Clinical Practice, Lebanon, New Hampshire; Ben Gurion University, Beersheba, Israel; Ministry of Health, Jerusalem, Israel; University of Birmingham, Birmingham, United Kingdom; and Erasmus University, Rotterdam, the Netherlands. Disclaimer: The views presented in this work represent the views of the authors and not the views of their employers or of the U.S. government. Acknowledgment: The authors thank Dr. Ezekiel Emanuel for his leadership in organizing the FRESH-Thinking workshops and helping to prepare initial drafts of the manuscript. Potential Financial Conflicts of Interest: Employment: L. Wulsin Jr. (Director, Insure the Uninsured Project). Consultancies: J.P. Newhouse (Director, Aetna). Stock ownership: D. Mechanic (McKesson Corporation); J.P. Newhouse (Equity ownership, Aetna); S.O. Thier (Director, Charles River Laboratories; Director, Merck & Co.). Grants Received: D. Mechanic (Robert Wood Johnson Foundation); L. Wulsin Jr. (The California Endowment, The California Wellness Foundation, L.A. Care Health Plan, Blue Shield of California Foundation). Royalties: D. Mechanic (The Truth about Health Care: Why Reform is Not Working in America. Piscataway, NJ: Rutgers Univ Pr; 2006.) Other: J.P. Newhouse (Director of NCQA [unpaid]). Requests for Single Reprints: Stephen M. Shortell, PhD, MPH, School of Public Health, University of California, Berkeley, 50 University Hall, Berkeley, CA 94720. Current Author Addresses: Dr. Arrow: Department of Economics, Stanford University, Landau Economics Building, 579 Serra Mall, Stanford, CA 94305-6072. Dr. Auerbach: Department of Economics and School of Law, University of California, Berkeley, 549 Evans Hall # 3880, Berkeley, CA 94720-3880. Mr. Bertko: 1084 East Sterling Lane, Flagstaff, AZ 86001. Mr. Bin Nun: Department of Health System Management, Ben Gurion University of the Negev, PO Box 653, Beer Sheva 84105 Israel. Ms. Brownlee: New America Foundation 1899 L St., Northwest., Suite 400, Washington, DC 20036. Dr. Bryan: Department of Health Economics, University of Birmingham, Edgbaston, Birmingham, B15 2TT United Kingdom. Dr. Casalino: Department of Public Health, Weill Cornell Medical College, 402 East 67th Street, New York, NY 10021. Mr. Cooper: United States House of Representatives Congressman, Tennessee 5th District, U.S. House of Representatives, 1536 Longworth House Office Building, Washington, DC 20515. Dr. Crosson: Kaiser Permanente Institute for Health Policy, 1950 Franklin Street, 20th Floor, Oakland, CA 94612. Dr. Enthoven: Graduate School of Business, Stanford University, 518 Memorial Way, Stanford, CA 94305-5015. Ms. Falcone: U.S. Congress, 1536 Longworth House Office Building, Washington, DC 20515. Dr. Feldman: Hill Physicians Medical Group, 868 Paramount Road, Oakland, CA 94610-2437. Dr. Fuchs: Department of Economics, Stanford University, Landau Economics Building, 579 Serra Mall, Stanford, CA 94305-6072. Dr. Garber: Department of Veterans Affairs Palo Alto Health Care System and Center for Health Policy, Stanford University, 117 Encina Commons, Stanford, CA 94305-6019. Dr. Gold: City College, City University of New York, 138th Street and Convent Avenue, Room J 920, New York, NY 10031. Dr. Goldman: David Geffen School of Medicine and School of Public Health, University of California, Los Angeles, PO Box 951772, Los Angeles, CA 90095. Ms. Hadfield: Law Center and Department of Economics, University of Southern California, 699 Exposition Boulelvard., Los Angeles, CA 90089-0071. Mr. Hall: Schools of Law and Medicine, Wake Forest University, Worrell Professional Center, PO Box 7206, Reynolds Station, Winston-Salem, NC 27109. Dr. Horwitz: Department of Medicine, Stanford University School of Medicine, 300 Pasteur Drive, Room S102, MC 5110, Stanford, CA 94305. Mr. Hooven: Enable Medical Technologies, 7778 Bennington Drive, Cincinnati, Ohio 45241. Mr. Jacobson: School of Public Health, University of Michigan, 109 Observatory Street, Ann Arbor, MI 48109. Mr. Stoltzfus Jost: School of Law, Washington and Lee University, 4008 Sydney Lewis Hall, Lexington, VA 24450. Dr. Kotlikoff: Department of Economics, Boston University, 270 Bay State Road., Boston, MA 02215. Dr. Levin: Department of Economics, Stanford University, Landau Economics Building, 579 Serra Mall, Stanford, CA 94305-6072. Dr. Levine: The Permanente Medical Group, 1950 Franklin Street, 20th Floor, Oakland, CA 94612. Dr. Levy: Varian Medical Systems, 3100 Hansen Way, M/S E-220, Palo Alto, CA 94304. Ms. Linscott: The Leapfrog Group, 1150 17th Street Northwest, Suite 600, Washington DC 20036. Dr. Luft: Palo Alto Medical Foundation Research Institute, 795 El Camino Real, Palo Alto, CA 94301. Dr. Luxenburg: Ministry of Health, Israel, 2 Ben Tabai Sreet, Jerusalem, Israel 93591. Dr. Mashal: Alinea Pharmaceuticals, 1 Memorial Drive, Suite 1225, Cambridge, MA 02142. Dr. McFadden: Department of Economics, University of California, Berkeley, 508-1 Evans Hall # 3880, Berkeley, CA 94720-3880. Dr. Mechanic: Institute of Health, Health Care Policy and Aging Research, Rutgers University, 30 College Avenue, New Brunswick, NJ 08901. Dr. Meltzer: Departments of Medicine and Economics and School of Public Policy, University of Chicago, 5841 South Maryland Avenue, MC 2007, Chicago IL 60637. Dr. Newhouse: Schools of Medicine, Public Health, Government, and Arts and Sciences, Harvard University, 180 Longwood Avenue, Boston, MA 02115. Dr. Noll: Department of Economics, Stanford University, Landau Economics Building, 579 Serra Mall, Stanford, CA 94305-6072. Dr. Pietzsch: Department of Management Science and Engineering, Stanford University, Terman Engineering Center, 3rd Floor, 380 Panama Way, Stanford, CA 94305-4026. Dr. Pizzo: School of Medicine, Stanford University, 300 Pasteur Drive, Room M-121, Stanford, CA 94305-5119. Dr. Reischauer: The Urban Institute, 2100 M Street, Northwest, Washington, DC 20037. Ms. Rosenbaum: School of Public Health, George Washington University, 2021 K Street, Northwest, Suite 800, Washington, DC 20006. Dr. Sage: School of Law, University of Texas at Austin, 727 East Dean Keeton Street, Austin, TX 78705. Mr. Schaeffer: University of Southern California, Lewis Hall 312, Los Angeles, CA 90089-0626. Dr. Shen: School of Public Health, Harvard University, 677 Huntington Avenue, Boston, MA 02115. Dr. Silber: Department of Neurology, School of Medicine, University of California, San Francisco, 513 Parnassus Avenue, San Francisco, CA 94143. Dr. Skinner: Dartmouth Institute for Health Policy & Clinical Practice, Dartmouth School of Medicine, 6106 Rockefeller Hall Dartmouth College, Hanover, NH 03755-3514. Dr. Shortell: School of Public Health, University of California, Berkeley, 50 University Hall, Berkeley, CA 94720. Dr. Thier: Departments of Medicine and Health Policy, Harvard Medical School, 55 Fruit Street, Boston MA 02114. Dr. Tunis: Center for Medical Technology Policy, 4712 Keswick Road, Baltimore, MD 21210. Dr. van de Ven: Erasmus University, Rotterdam, The Netherlands, PO Box 1738, 3000 DR Rotterdam, the Netherlands. Mr. Wulsin Jr.: Insure the Uninsured Project, 2444 Wilshire Boulevard, Suite 415, Santa Monica, CA 90403. Dr. Yock: Department of Bioengineering, Stanford University, 318 Campus Drive, Room E100 Stanford, CA 94305-5428. While there is no shortage of proposals and plans for health care reform, the chances of any plan being enacted into law depend on the practical and political realities of the U.S.
One of those sets of realities include the political framework and power structures that control American society. In this article, three PhDs comment on the cost control challenges that any health care reform plan will face. Controlling the costs of medical care has long been an elusive goal in U.S. health policy. This article examines the options for health care cost control under the Obama administration. The authors argue that the Obama approach to health reform offers some potential for cost control but also embraces many strategies that are not likely to be successful. Lessons the United States can learn from other countries’ experiences in constraining medical care spending are then explored. The Obama administration will face no shortage of political obstacles if it boldly pursues comprehensive health reform. Securing a Congressional majority for any large-scale expansion of insurance coverage is a formidable task. Yet adopting reforms that control costs in American medical care is an even greater challenge. We address the challenges of cost control in 4 parts. First, we describe pressures for cost control and the impact of the current recession. Second, we discuss the political barriers to adopting effective cost controls in the United States. Third, we examine what the Obama team has advanced as cost-control instruments. Finally, we draw on international experience to offer lessons about what does and does not work in controlling medical spending. We begin by noting the obviously compelling case for cost control. Increasing costs erode our system of employer-sponsored insurance, swell the ranks of the uninsured, reduce workers’ wages, crowd out spending on other social priorities, and strain federal and state budgets for Medicare and Medicaid (1, 2). The ongoing economic recession exacerbates these problems. Widespread job losses mean that millions of Americans stand to lose health insurance. In this economic climate, employers also face intensified pressures to restrain health care spending and cut back on insurance coverage for those still employed. Meanwhile, rising unemployment levels mean many more Americans are eligible for Medicaid. States face an acute fiscal dilemma: They must find a way to pay for growing Medicaid enrollment precisely when tax revenues are declining (and balanced-budget rules preclude deficit spending in virtually all states). In the short term, the federal government is intent on spending more, not less, money on health care. Congress has already expanded health insurance for low-income children through reauthorization of the State Children’s Health Insurance Program. It has also adopted additional measures, as part of a broader economic stimulus package, to provide states with more money for Medicaid and to subsidize private health insurance premiums for the newly unemployed. Another measure makes a large-scale federal investment in health information technology. However, pressure to control federal health care spending is likely to build again as a result of exploding federal budget deficits. The Obama administration has pledged to cut the federal budget deficit in half by 2013. Moreover, if Congress and the Obama administration push forward with bolder plans to move the United States toward universal coverage, those plans will have to tackle cost control to meet the financing challenges inherent in expanding insurance coverage. The United States spends more than any other country on medical care (3). In 2006, U.S. health care spending was $2.1 trillion, or 16% of our gross domestic product (4). At the same time, more than 45 million Americans lack health insurance and our health outcomes (life expectancy, infant mortality, and mortality amenable to health care) are mediocre compared with other rich democracies. We spend too much for what we get (5, 6). Nothing is new about these sobering realities. The Nixon administration first declared a health care cost crisis in 1969 (7). Four decades later, the United States still has not adopted systemwide cost controls because the politics of health care make it extraordinarily difficult to control costs. Here we explain why this is so. The starting point for understanding the politics of cost control is an axiom of medical economics: A dollar spent on medical care is a dollar of income for someone. In other words, national health expenditures constitute the money that the medical care industry—from doctors, nurses, and hospitals to pharmaceutical companies, insurers, lawyers, and sales and marketing staff—earns. Controlling costs necessarily requires restraining the industry’s income (8, 9). As a consequence, serious attempts at cost control produce a battle with stakeholders who have resources, political clout, and strong incentives to oppose measures that reduce the rate of medical spending growth and their income. The Clinton administration’s health reform misadventure during 1993 and 1994 illustrated these political dynamics. The Clinton Health Security plan proposed meaningful cost control, including a de facto budgetary cap on national health spending. That clearly threatened the incomes of many stakeholders and triggered predictably fierce opposition (10). Since the Clinton plan’s demise, American politicians have largely avoided proposing or talking about serious cost control. After 1994, reform efforts at both the federal level (such as the State Children’s Health Insurance Program) and state level (such as in Massachusetts) have concentrated on expanding insurance coverage, not restraining costs. The lesson evidently learned from the Clinton experience was that it is extraordinarily risky to take on the medical industry. Although rising costs have helped to push health care reform back onto the agenda during the past decade, it is thus not surprising that reformers have not pursued serious measures to slow spending. During the 2008 presidential election, the Obama campaign advanced a number of ideas for cost control that will presumably shape the administration’s approach to the issue. These proposals fall into 2 categories: improving medical practice and health outcomes and changing the structure of the health insurance marketplace. We discuss the promise and limits of these strategies. The first category of proposals called for more emphasis on prevention, wider adoption of health information technology (HIT), better management of chronic diseases, payment reforms that would pay providers on the basis of outcomes, and research on comparative effectiveness to identify preferred diagnostic and treatment options (11). These reforms—supported by many in the health policy community—are certainly desirable in theory. The United States lags behind many other countries in the implementation of HIT, and the Veterans Health Administration’s experience suggests HIT can contribute to the improvement of medical quality (12, 13). Policies to improve coordination of chronic care and strengthen prevention are always welcome, and the United States might also benefit from the establishment of an independent institute that informs decisions about medical care utilization and the covering of new technologies (14–16). However, none of these measures is likely to substantially reduce health care spending in the short run, even if they are worthwhile long-term investments that improve quality of care and health outcomes. The Congressional Budget Office (CBO) has issued a report disputing claims of sizable savings from moving to electronic medical records; other CBO studies cast doubt on the capacity of disease management programs to reduce costs (17, 18). Despite the current enthusiasm for its potential, undertaking comparative effectiveness research alone does not necessarily save money; the savings depend on the uncertain effect such research has on insurers’ coverage decisions for medical technologies and on changes in medical practice (19). In other words, although comparative effectiveness research may provide useful information about the clinical effectiveness and costs of medical treatment options, that information is not guaranteed to lead to significant cost savings. A 2008 CBO report estimated that an initiative to fund comparative effectiveness research would reduce national health care spending only “by an estimated $8 billion over the 2010–2019 period (or by less than one tenth of 1%)” (20). Similarly, the potential for prevention to generate cost savings is often exaggerated. As health economist Louise Russell documents, “over the past 4 decades, hundreds of studies have shown that prevention usually adds to medical spending” (21). Fewer than 20% of studied preventive options are cost-saving (21, 22). Indeed, preventive measures that emphasize medical services (such as annual doctor visits and screening) rather than behavioral change (exercise and nutrition) can be costly (23, 24). Moreover, changing behavior is not easy. For example, producing behavioral changes that reduce high and increasing obesity rates in the United States (which some analysts argue are a major cause of rising health care spending) is surely desirable (25). It is, however, unclear what public policies could be adopted that would promptly and reliably reduce obesity rates. It is also unclear whether paying medical providers on the basis of outcomes (pay for performance [P4P]) will generate savings. Pay for performance initiatives have generally been designed to improve the quality of medical care, although these efforts have had “lackluster early results” (26). Little investigation of the effect of P4P on medical spending has been conducted to date. However, American P4P programs often aim to increase use of selective medical services (such as preventive screenings), so cost savings are not the primary goal (27). International experience with paying for quality echoes this pattern. A British P4P initiative that aimed to increase spending as well as the use of targeted services overshot its spending targets by a wide margin (28, 29). At this point, we lack evidence that paying providers on the basis of outcomes will reduce spending on medical care. Debatable claims about cutting costs by improving medical practices and health outcomes create an important, additional problem: The Obama administration may have to persuade the CBO to agree with the savings estimates in its health plan to conform with Congressional budget rules. The CBO has taken a skeptical view of the potential of incremental measures, such as electronic medical records and comparative effectiveness research, to control costs. As a result, the Obama administration could be forced to consider more compelling (and controversial) cost-control strategies to finance its health reform plan and get it through the Congressional budget process (30). 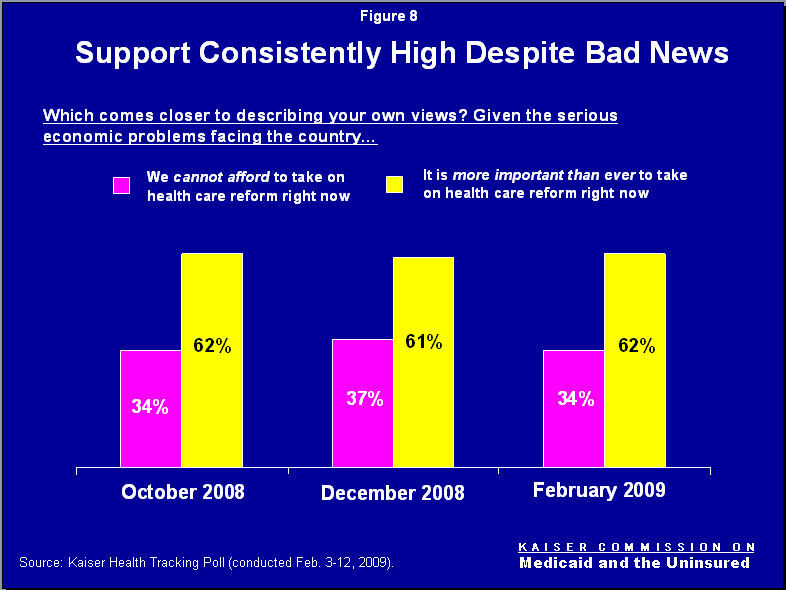 The Obama campaign also proposed to address increasing costs by restructuring the health insurance marketplace. This approach included the establishment of a new public insurance plan for individuals under age 65. In addition, the Obama campaign called for creating an insurance marketing exchange and adopting new regulations to reduce overhead costs from U.S. insurance arrangements (11). Insurance regulation can reduce costs (in principle) by limiting the resources that private insurers put into avoiding sales to less healthy customers and charging them much higher premiums. By prohibiting such medical underwriting and by requiring insurers to accept applicants regardless of health status, President Obama’s health reform approach could produce some administrative savings. An effective insurance exchange (a new agency that would offer Americans a choice of health insurance plans while also regulating insurers) can lower the high administrative costs that are typical in the current individual and small group insurance markets (31). In addition, the Obama platform proposed more direct limits on insurance overhead. It promised to “force insurers to pay out a reasonable share of their premiums for patient care instead of keeping exorbitant amounts for profits and administration” (11). The public plan, essentially a voluntary Medicare equivalent for Americans under age 65, could save money in 3 ways. First, it could take advantage of the lower administrative costs of government programs, such as Medicare. Second, the public plan could use its substantial market power to restrain the prices of the medical care it finances. The extent of savings would partly depend on the size of the public plan’s enrollment; a larger plan would have more purchasing power to control costs. Savings would, of course, also depend on the political willingness to reduce payments to medical providers. Finally, the combination of marketing regulation and competition from the less expensive public plan could also prompt private insurers to innovate in ways that lowered costs (32, 33). Lessons from Abroad: What Works and What Does Not Work? In this section, we ask what the United States can learn from international experience with controlling the costs of medical care (34, 35). In fact, the Obama proposals for insurance regulation and a new public insurance option do follow, in part, from international experience. All other rich democracies concentrate purchasing power to counter the medical industry’s efforts to increase costs (34). If, as in Canada and Sweden, overall medical costs are on public budgets, then officials have powerful incentives to restrain increases in medical costs to avoid reducing the funds for other public programs or having to raise taxes (36). In other countries, such as Germany and France, insurers are nongovernmental entities (sickness funds) that are financed through payroll contributions from employers and employees. The governments of these countries regulate insurers and help them control costs (34). Germany, for example, regulates the level of social insurance contributions (taxes) paid by employers and workers, thereby limiting the budget for all sickness funds. Lower prices for medical care are the major explanation for the much lower medical costs of all the other rich democracies relative to the United States (37). Competing explanations—that the U.S. population is particularly unhealthy or that Americans use many more medical services—are largely false. In a detailed examination of health care spending patterns, the McKinsey Global Institute concluded that the United States population is “not significantly sicker” than those of Japan, Germany, France, Italy, Spain, or the United Kingdom (3). McKinsey also found that “U.S. patients consume approximately 20% less prescription drugs” in 9 therapeutic areas than do patients in Germany, Canada, or the United Kingdom (3). Further, the average number of hospital days per year in the United States is the second lowest among 12 comparison countries, although American patients do receive more inpatient surgeries and imaging services than patients in most peer countries (3). Other studies (38) similarly conclude that “the prices of care, not the amount of care delivered, are the primary difference between the United States and other countries” in health care spending. International evidence also supports the emphasis on the administrative costs of health insurance. All studies agree that the United States has excess administrative costs that are substantially higher than those of other rich democracies (3, 34, 35, 39). The Obama public insurance option draws on this comparative experience. It avoids the marketing expenses of private insurance and the costs of medical underwriting (the process insurers use to decide whether to offer applicants coverage and to calculate premiums on the basis of health status) (40). In addition, a public plan does not have to generate profits to reward its stockholders. President Obama’s proposal for an insurance exchange also mirrors international experience with systems in which multiple organizations pay for medical care (often referred to as multipayer systems). Requiring common benefits; similar payment standards; and other simplifying rules, such as prohibiting medical underwriting, can reduce administrative expenses well below those of the United States, as demonstrated by Germany’s sickness funds (34). The Obama campaign’s planned prohibition of medical underwriting and its adoption of new insurance regulations would move the American insurance arrangements closer to the international standard (34). The Obama team’s approach to health reform does not, however, fully embrace the central lesson of international cost-control experience. Effective cost control requires strong government leadership to set targets or caps for spending in the various sectors of medical care (hospital, pharmaceutical, and physicians), either directly or through insurers. The targets may not always be binding, and these caps would be on total expenditures, not services. But without explicit targets and continual efforts to enforce them, no health care system can control costs. That lesson is evident in countries ranging from Canada, Sweden, and the United Kingdom to France, Germany, and Japan (34). In Germany, for example, caps adopted in 1986 had a dramatic effect on spending for physician services. Some analysts stress other, less reliable lessons about how other countries have controlled costs (41). These arguments often confuse association with cause. For example, other nations do indeed use electronic health records (EHRs) more widely than the United States, but use of EHRs is not why they spend less on medical care. These countries had much better cost control than the United States long before the spread of EHRs (34). No studies have identified different levels of use of health information technology as a primary explanation for why U.S. health care costs exceed those of other nations. Similarly, the United Kingdom does have a National Institute for Health and Clinical Excellence (NICE), and health care costs in the United Kingdom are much lower than in the United States. But these facts are not causally related. The NICE makes recommendations about covering new medical technologies and interventions on the basis of cost-effectiveness principles (and is often cited as a model by American advocates of comparative effectiveness research) (42). However, NICE’s main aim has been to rationalize decision making about coverage decisions rather than to constrain spending; it has not operated as an instrument of cost control. Indeed, since NICE’s establishment in 1999, spending in the National Health Service has dramatically increased (from 7.2% of gross domestic product in 2000 to 8.4% in 2006) as the British government sought to meet the European Union norm and satisfy long-standing demands for improved, more accessible medical services (43). In short, if medical costs are to be controlled, no substitute exists for constraining prices and capping expenditures. Frank talk about these cost control realities, however, is politically difficult. It immediately elicits alarms from the medical care and insurance industries about “rationing” (ignoring the fact that the United States could realize significant savings from lower prices and administrative costs). Others, particularly the pharmaceutical industry, raise alarms about the effect that cost control would have on the pace of medical innovation. In addition, spending targets constrain medical providers’ income and thereby prompt intense political struggles. The Obama team’s limited treatment of cost control realities—including the absence of global budgets and spending targets or caps—seems to reflect a desire to avoid such political controversies. We write this essay, then, as a cautionary tale. Claims of savings from health information technology, prevention, P4P, and comparative effectiveness research are politically attractive. Their political appeal lies largely in the embrace of widely supported goals, including better health and improved quality of medical care. In theory, these reforms—more research, more preventive screenings, and better organized patient data—sound like benign devices to moderate medical spending. For many purposes, such reforms are substantively very desirable. But these reforms are ineffective as cost-control measures. If the United States is to control health care costs, it will have to follow the lead of other industrialized nations and embrace price restraint, spending targets, and insurance regulation. Such credible cost controls are, in the language of politics, a tough sell because they threaten the medical industry’s income. The illusion of painless savings, however, confuses our national debate on health reform and makes the acceptance of cost control’s realities all the more difficult. From Yale University, New Haven, Connecticut; University of North Carolina–Chapel Hill, Chapel Hill, North Carolina; and Case Western Reserve University, Cleveland, Ohio. Requests for Single Reprints: Jonathan Oberlander, PhD, Department of Social Medicine, UNC School of Medicine, CB#7240, Chapel Hill, NC 27599-7240; e-mail, oberland@med.unc.edu. Current Author Addresses: Dr. Marmor: Yale School of Management, 135 Prospect Street, Box 208200, New Haven, CT 06520-8200. Dr. Oberlander, Department of Social Medicine, UNC School of Medicine, CB#7240, Chapel Hill, NC 27599-7240. Dr. White: Mather House 113, 11201 Euclid Avenue, Cleveland, OH 44106-7109. 1. Nichols L. A Sustainable Health System for All Americans. Washington, DC: New America Foundation; 2007. 3. Angrisano C, Farrell D, Kocher, B, Laboissiere M, Parker S. Accounting for the Cost of Health Care in the United States. San Francisco: McKinsey Global Institute; 2007. Accessed at www.mckinsey.com/mgi/rp/healthcare/accounting_cost_healthcare.asp on 30 November 2008. 7. Starr P. The Social Transformation of American Medicine. New York: Basic Books; 1982. 8. Marmor TR. Political Analysis and American Medical Care. New York: Cambridge Univ Pr; 1983. 9. Evans RG. Strained Mercy: The Economics of Canadian Health Care. Toronto, Ontario, Canada: Butterworths; 1984. 10. Johnson H, Broder DS. The System: The American Way of Politics at the Breaking Point. Boston: Little, Brown; 1996. 11. Barack Obama and Joe Biden’s Plan to Lower Health Care Costs and Ensure Affordable, Accessible Health Care Coverage for All. 2008. Accessed at www.barackobama.com/pdf/issues/HealthCareFullPlan.pdf on 20 February 2009. 15. Institute of Medicine Roundtable on Evidence-based Medicine. Learning what works best: the nation’s need for evidence in comparative effectiveness in health care. Washington, DC: Institute of Medicine; 2007. 17. Congressional Budget Office. Evidence on the Costs and Benefits of Health Information Technology. Washington, DC: Congressional Budget Office; 2008. 18. Congressional Budget Office. High-Cost Medicare Beneficiaries. Washington, DC: Congressional Budget Office; 2005. 19. Neumann PJ. Using Cost-Effectiveness Analysis to Improve Health Care: Opportunities and Barriers. New York: Oxford Univ Pr; 2005. 20. Congressional Budget Office. Budget options. Volume 1: Health Care. Washington, DC: Congressional Budget Office; 2008. 23. Welch HG. Campaign myth: prevention as cure-all. New York Times. 7 October 2008. Accessed at www.nytimes.com/2008/10/07/health/views/07essa.html?partner=rssnyt&emc=rss on 20 February 2009. 24. Russell LB. Prevention’s Potential for Slowing the Growth of Medical Spending. Washington, DC: National Coalition on Health Care; 2007. 29. Galvin, R. Pay-for-performance: too much of a good thing? A conversation with Martin Roland. Health Aff (Millwood). 2006;25:w412-19. 32. Holahan J, Blumberg L. Can a Public Insurance Plan Increase Competition and Lower the Costs of Health Reform? Washington, DC: Urban Institute Health Policy Center. October 2008. Accessed at www.urban.org/UploadedPDF/411762_public_insurance.pdf on 20 February 2009. 33. Hacker JS. Health care for America: A proposal for guaranteed, affordable health care for all Americans building on Medicare and employment-based insurance. Briefing Paper 180. Washington, DC: Economic Policy Institute; 2007. Accessed at www.sharedprosperity.org/bp180/bp180.pdf on 20 February 2009. 34. White J. Competing Solutions: American Health Care Proposals and International Experience. Washington, DC: Brookings Institution; 1995. 36. Marmor TR. Understanding Health Care Reform. New Haven: Yale Univ Pr; 1994. 39. Ginsburg PB. High and Rising Health Care Costs: Demystifying U.S. Health Care Spending. Princeton: Robert Wood Johnson Foundation; 2008. Accessed at www.rwjf.org/pr/product.jsp?id=35368 on 20 February, 2009. 40. Claxton G. How Private Insurance Works: A Primer. Menlo Park, CA: Kaiser Family Foundation; 2002. Accessed at www.kff.org/insurance/upload/How-Private-Insurance-Works-A-Primer-Report.pdf on 20 February 2009. 43. Growth in health spending slows in many OECD countries, according to OECD health data 2008. Paris, France: Organisation for Economic Cooperation and Development; 2008. Accessed at www.oecd.org/document/27/0,3343,en_2649_34631_40902299_1_1_1_37407,00.html on 20 February 2009. What a comprehensive explanation of what is going on in California Health Insurance and what is at stake. Thank you.